If you want a cheap holiday then you cannot go far wrong with The Sun £9.50 holidays. These cost from £38 as they are based on a minimum of 4 people sharing. Then you can add extra costs for entertainment, service, upgrades, catering, insurance and so on. If you are looking for the cheapest way to get away then you will want to try to go to the parks that are a guaranteed no more than £9.50pp but these are only on selected dates. 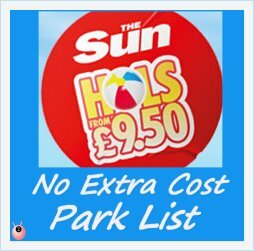 I have compiled a list of the parks and their dates in the UK guaranteed to be no more than £38 (based on 4 people sharing or an extra £9.50 pp after that) Do remember that you will still need food and transport costs on top of this too. This is ideal if you are worried about going in school time as they are cheap enough just to go for the weekend. Remember to check your school holidays and inset dates, plus May Bank Holidays are the 4th and 25th. CHECK BEFORE BOOKING. I am not affiliated with The Sun have manually compiled this list to help myself and others. I am human and it may have errors so do double-check first. Everything is correct to the best of my knowledge. I notice that several parks have changed their names and most have different numbers this year. Note that all of the Butlins have the week commencing April 27th 2015 as a guaranteed £9.50pp holiday so if you don’t have any children, or do not mind them missing school then this is the perfect week to try for. 19. Pontins Pakefield – all breaks in February, September and November, and 2, 6, 9, 13, 16, 20, 23, 27 March, 17, 20, 24, 27 April, 1, 8, 11, 15, 18 May, 2, 5, 9, 12, 16, 19, 30 October. 64. Pontins Southport – All breaks in February, September and November and 2, 6, 9, 13, 16, 20, 23, 27 March, 17, 20, 24, 27 April, 1, 4, 8, 11, 15, 18 May, 2, 5, 9, 12, 16, 19, 30 October. 66. Pontins Prestatyn Sands – All breaks in February, September and November and 2, 6, 9, 13, 16, 20, 23, 27 March, 17, 20, 24, 27 April, 1, 4, 8, 11, 15, 18 May, 2, 5, 9, 12, 16, 19, 30 October. 135. Pontins Brean Sands Holiday Park – All breaks in February, September and November and 2, 6, 9, 13, 16, 20, 23, 27 March, 17, 20, 24, 27 April, 1, 4, 8, 11, 15, 18 May, 2, 5, 9, 12, 16, 19, 30 October. 170. Pontins Camber Sands, Holiday Park – All breaks in February, September and November and 2, 6, 9, 13, 16, 20, 23, 27 March, 17, 20, 24, 27 April, 1, 4, 8, 11, 15, 18 May, 2, 5, 9, 12, 16, 19, 30 October. Sun £9.50 Holidays are Back - But things have Changed! Extremely useful stuff – have shared this too! Such a great list, thank you for putting this all together, I think it’s great the Sun does this each year. Great list Joy, must have taken ages, will share! Gosh why am i never organised enough to get these deals! We have had a few Sun Holidays – you can’t go wrong for the price can you! Ooooh, I’ve never done one of these, off to check them out. Very useful list! Thanks for sharing this. It is definitely worth considering. Will share on Twitter. Great post. Now to convince the OH that we need a holiday! That saves me a bit of time. Thanks. We have been on a few sun holidays and they offer great value for money! Hoburne park Christchurch – 9th of March is listed by the sun as only 9.50 but when I booked I was told by the park it’s not, it’s actually just no service charge on that date and I will have to pay for passes. Luckily it’s not much but it’s quite annoying so be careful when booking that you know exactly what you have to pay. That is REALLY annoying. Have you mentioned it on the Sun’s forum too? Thanks for the warning. Hope you have a great holiday.